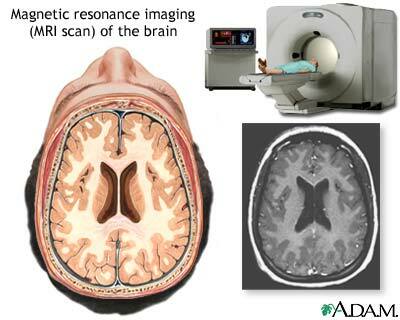 Multiple Sclerosis lesions, also called plaque or white spots, are able to be seen on an MRI. They are areas in the central nervous system (CNS) that have become damaged or inflamed. The result of demyelination, the lesions can be located anywhere in the brain or along the spinal cord. When lesions are in the central nervous system, neurons can't move impulses throughout the system very well. That is why you have the symptoms associated with MS. The symptoms you have depend on the location of the various white spots. When your neurologist orders an MRI, it's usually because he suspects the symptoms you have may point to MS. This is usually after your doctor has performed several other tests in his office. They may ask you to perform simple tests like touching your nose and then the tip of his finger several times. Or following his moving finger with your eyes. Doing this may make you feel a little silly but they tell the doctor certain things. These tests along with several others let the doctor know that something is wrong in your CNS. Once the MRI is done, your neurologist will look at the results on his computer. (They used to be on film similar to an x-ray - now they're on CDs). Cir usually gets a copy and we're able to take it home and see what the doctor sees. Most multiple sclerosis lesions are pretty easy to see. However, they take a skilled technician to find them. They may be very small or some can be very large. They may be in one area of the brain or sprinkled throughout. As I said earlier, the location of the lesions, determines the type of symptoms you have. It is possible to have no lesions and still have MS. Here's a short video talking about this phenomenon. As more and more doctors research the growing collection of MRI's taken of their MS patients, they are finding that not all lesions are the same. Some researchers feel there may be 4 different types of lesions. These different types correspond to the different stages of MS. Acute stage MS lesions have a large number of white blood cells which goes along with the inflammation seen in the early stages of MS. In later stages or more progressive forms of multiple sclerosis, doctors see different types. Their findings lead them to believe that they can develop more specific kinds of treatments focusing things like remyelination. After Cir's last MRI, the doctor and technician said they saw no change from his prior test. That was good. This probably explains why Cir hasn't had any new symptoms in quite awhile. Another thing the doctor once told us was that the location of the lesions doesn't necessarily show the severity of the disability you may have. One person may have severe disability with just one plaque. Another may have barely any with a plaque in the same or similar location. That is why an MS prognosis is so hard to come by. Most doctors won't even try until they have watched your progression for several months or even better still, several years. After that time, they may be able to say what type of MS you have and what will possibly happen in the years to come. If you have documented your symptoms (or can at least remember most of them), a doctor may be able to tell based on the years before. And the fact that 75-80% of people begin with relapsing-remitting MS, doctors can safely give that diagnosis after reviewing your history and treating you for several months. So when you have multiple sclerosis, lesions, white spots, plaques, scars, or however you refer to them - are part of your life. Too bad you can't just get a bottle of spot remover and wash them out. Quick and easy. Unfortunately, it's not that easy. Go from Multiple Sclerosis Lesions back to What is MS.